Cartwright’s work on Ella Fitzgerald led me to analyze Benny Harris’ bop standard ‘Ornithology’ in an earlier blog post and show how Harris’ composed tune, like Fitzgerald’s solo, was assembled from a vocabulary of ‘licks’, but in case of ‘Ornithology’ Harris was drawing all the pieces of his collage from the melodic vocabulary of a single player, Charlie Parker. 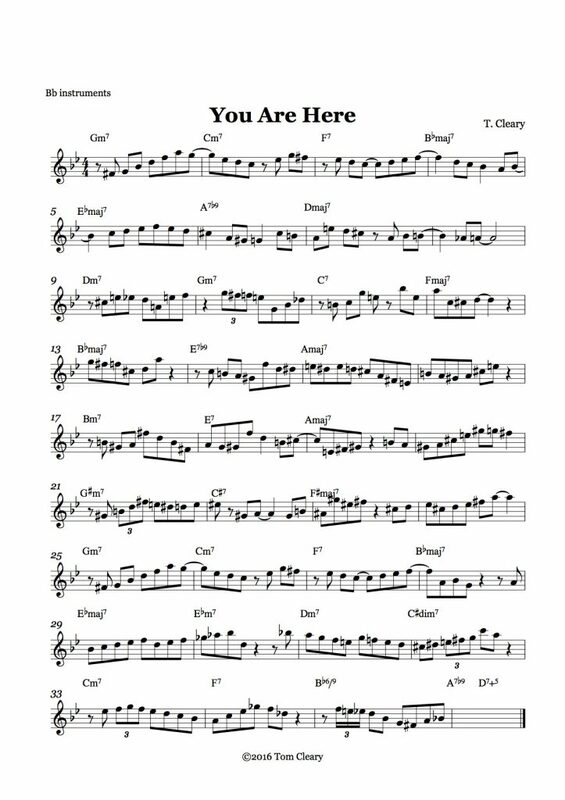 ‘Ornithology’, like some of Harris’ other lines, is based on the chord changes from an earlier tune (‘How High The Moon’), but also works as a countermelody to that tune. In ‘You Are Here’, I challenged myself to compose a melodic line which, like ‘Ornithology’, is based on a pre-existing set of chord changes (‘All The Things You Are’), uses excerpts from the melodic language of a single player (Bud Powell) and also works as a countermelody to the tune from which its chord changes are borrowed. 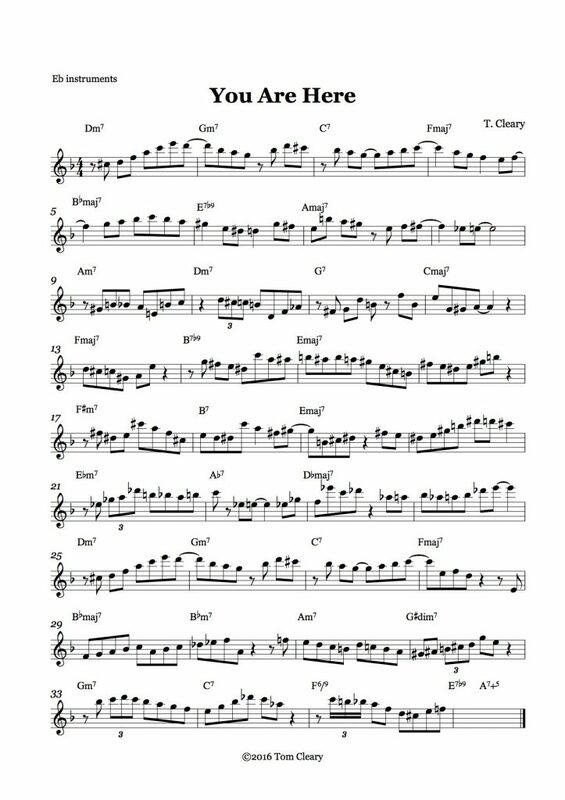 This tune can be used as a head (as I do in a short solo piano version of the tune that I recorded ), as a countermelody (as it is in the version by my band Birdcode, where I added an original long-note vocal melody to replace ‘All The Things’), or as an etude that models the use of eighth notes and bebop chromatacism in a solo. (One of my students, Remi Savard, posted his own version of ‘You Are Here’ on SoundCloud.) I hope that it might lead you to to check out the music of Bud Powell (in this tune I borrowed licks from his tunes ‘Bouncin’ With Bud’ and ‘Dance of The Infidels’ and his solos on ‘Un Poco Loco’ from The Amazing Bud Powell Volume 1, ‘Cheryl’, ‘Donna Lee‘ and ‘Buzzy‘ from his one studio session with Charlie Parker, and a live version of ‘Ornithology’ for which I studied Ethan Iverson’s transcription in his blog post ‘High Bebop’. The specific page I used is here. Iverson’s series of posts titled ‘Bud Powell Anthology’ are extensive and well worth reading.) 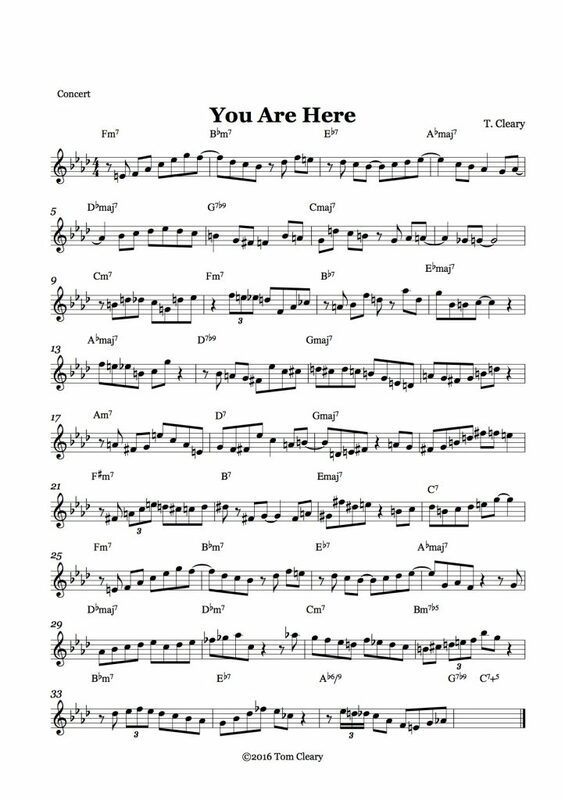 I also hope learning ‘You Are Here’ might lead you to use more eighth notes and bop concepts in your improvising, and perhaps to compose your own melody based on ‘All The Things’ changes as a kind of slow-motion practice of the improvising process. There are tunes by a number of great jazz players based on the ‘All The Things’ progression, such as Dexter Gordon’s ‘Boston Bernie’ and Kenny Dorham’s ‘Prince Albert’. These tunes are interesting microcosms of their composers’ improvisational language, and learning them may give you ideas for composing a tune that imitates or contrasts their approach. I hope you’ll also give ‘You Are Here’ a try. 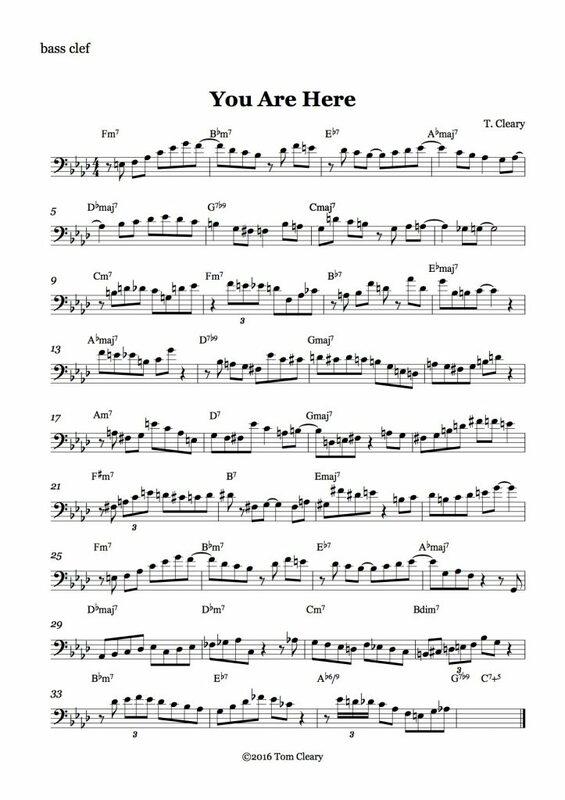 I have added charts in transpositions for all common jazz instruments below. Please feel free to share in the comments section any thoughts you have on practicing ‘All The Things’ and/or ‘You Are Here’, as well as other recordings of ‘All The Things’ you find enjoyable and inspiring.